Walipini or Geodesic Biodome Greenhouse? Normally I focus on geodesic greenhouses but this old-yet-new design caught my eye recently. Its got a weird name but it works and its cheap to build too. Its know as the Walipini and it utilizes natural forces to provide warmth, light and protection for year-round vegetable growing. Location, location location. In real estate and when building a greenhouse, even one 6’- 8’ underground, location is essential. Then capturing and storing daytime solar radiation as heat and plant growth comes next. A Walipini, is a rectangle shaped hole cut into the ground (hire a backhoe!) then covered by greenhouse plastic. The long face of the rectangle aims to the winter sun while a thick wall of rammed earth at the back of the building soaks up any available solar gain. Then a much lower wall at the front provides the needed angle for supporting the plastic roof of the greenhouse. This roof seals the greenhouse, provides an insulating airspace, and allows the sun to create a warm, stable environment for plant growth. Because the Walipini is an earth sheltered building it uses the thermal mass of the and seasonal temperature lag of the earth to keep the indoor climate stable, thus much less energy is needed to heat up the earth sheltered greenhouse vs. an above ground one. Of course, one must take care with waterproofing, drainage and ventilation, as well as solar alignment, just as you would when building any kind of greenhouse. Best of all, a 20ft x 60ft can be build for a total cost of around $300, if you use free or your own labor of course! 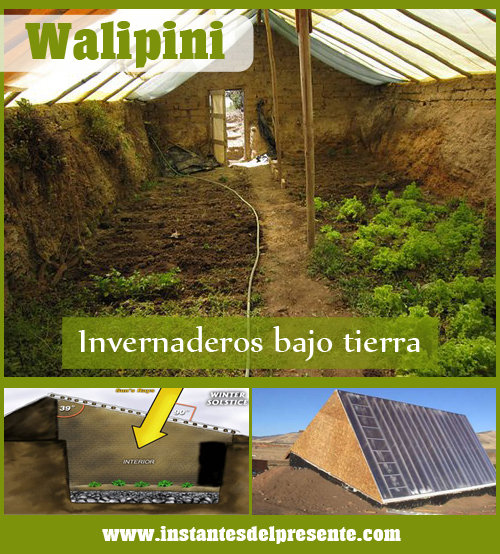 Cheap but effective, the Walipini underground greenhouse is a great way for growers to produce food all year round. 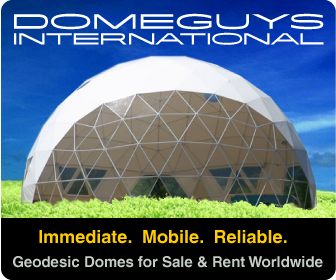 But, if you have high water table, are on bedrock, just love domes and or don’t have soil suitable for earth sheltered building, go with the biodome greenhouse. But if you have less money and lots of friends who like to dig, then the Walipini might be a great option! This entry was posted in Build a Greenhouse Cheap. Bookmark the permalink. 25 Responses to Walipini or Geodesic Biodome Greenhouse? What about combining the two concepts together? What if you dug out a walipini, and topped it in a geodesic cylinder? Wouldn’t you have the best of both worlds and an increased likelihood of artificial clouds? And, hypothetically, what if instead of building a rectangle you dug a circle and had the walls set in tiers with a geodesic dome on top? In either case, I imagine that the dome would be supported at ground level, but you would have more and more headroom the deeper in you went. Would that be beneficial though? Or would you lose some of the benefits of either design? Try it out and report! I like the way you are thinking. Out of the sphere, so to speak! As far as I know nobody has done what you are suggesting though the first nations people in the South West did make circular pit houses with a cover over that had a great moderating effect on the very cold winter temperatures so why wouldn’t the same thing work with a biodome? I have some land suitable for building a Walipini, but with local building codes a solid foundation is required so I think in about a year or so I will construct a Walipini with a geodesic cylinder on top and see how it goes. Thinking further ahead though: The world’s largest Geodesic domes are, if I recall correctly, in Singapore and measure 38 meters tall from ground level. They use water as the primary temperature control mechanism, but I would be very curious to see what would happen if you had a giant dome like that that also goes as deep as it goes tall. Imagine, for example, a mile wide dome set into the side of a mountain. If you used waterfalls on the perimeter and had the water go down a bit below ground level that would help as an energy store drawing the heat of the into the water while reflecting light back at the plants for better illumination and would also act as a cold sink. The total area would be just under 22 and a half acres and you would have a height of around 250 feet. The waterfalls would help catalyze cloud formation and it would be tall enough for the tallest trees in the world to thrive. Now, in principle, what if you built something like that in the far north where the cost of food is so high people willbeasily spend $50 for a head of lettuce. What if you could build a domed garden that can provide for all of the people’s food needs, but also provide housing. You could easily have entrances to housing between waterfall segments and at that far down there would be no heating or cooling issues. Variations in day length could be adjusted for with LED lighting in the dome itself powered by wind systems. How cool would it be to have a tropical forest in the near Arctic? Of course, thinking back to a small scale, something that I would really like to do in a few years is build something like that on a small scale. Maybe combining the concepts of a tiny house with a geodesic dome and the Walipini so that way your front yard is tropical year round and you won’t need any heating or cooling systems in your tiny house. If you built it in the presence of a natural spring you wouldn’t even need running water or electricity to keep water moving. Unfortunately, I already asked the city about something like that and basically the City Code I won’t allow anything like that for a number of reasons, but I’ll try it out eventually. The best I can do right now is the foundation supported walipini with a geodesic cylinder on top connected to an adjacent house. Please whatever you do, document your build and share your learning. There are examples already but at a much lower level of ambition. 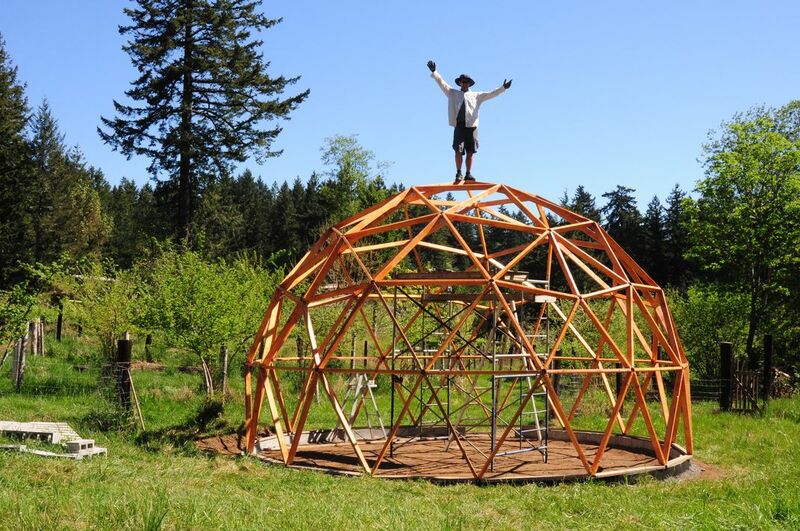 I totally dig your geodesic greenhouse house idea! What a great concept only one face of your house faces “outside” and so you get the best of all climates and a huge livingroom to relax in! Are you actually saying that your local gov’t denies your right to dig a hole on your property w/o installing a foundation? hey Elliander; so glad you asked that question because I have been searching for some info about that idea. I live in Michigan and thought that a walipini/ dome would be just the thing to help with temp control in winter. But just thinking about building costs.. probably would be more expensive to build than just a dome greenhouse.. ya think.. since excavation would add to cost and the cement blocks/cement for foundation… but save in the end with the temp control for raising more veggies in winter…. but also there wouldn’t be as much wood used for the dome since it’d be just the top portion. I have a good slope in my pasture that I have been contemplating building something like this. Guess I need to start with some inquiries about codes and cost of materials first…. love the dome idea and want one. I think either way I am going to start with a small ground level one first. Weather in Michigan has been so screwy the past few years and need a greenhouse for my hot weather plants. Please build a Walipini Geodesic Hybrid! We are all curious how it would work and if you can get it code approved… wow! That would be worth hearing about! I am thinking of putting a pyramid either inside or over my biodome to see if that improves the yield. On that note we just harvested navel oranges and small green and black olives! Not bad for January in Canada! Long live the biodome greenhouse! As soon as weather permits I am breaking ground for a 20 foot 4/9 Kruschke Geodesic dome greenhouse. The structure will be geothermal with earth tubes buried 8 feet deep, the floor will be 4ft deep. The greenhouse will include a cistern, a cupola used as a solar chimney with thermally operated windows to provide air circulation and solar cells to power a fan that will circulate warm air from the earth tubes during the winter. The frame is made from 25 gauge steel and it will be covered with 6mil polycarbonate. I am getting excited for the weather to warm up! Awesome! 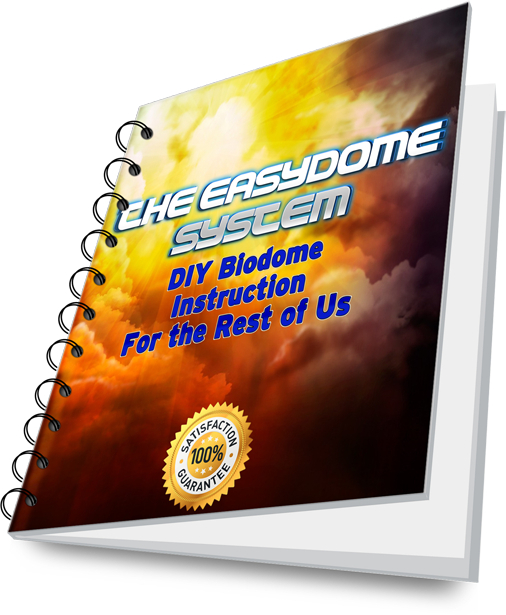 Are you using the video instruction series from http://www.biodomerevolution.com? Please send pictures your project sounds even more ambitious than the walipini biodome hybrid! Also where are you located? I am not using the biodome videos, I am using a frame of my own design that eliminates the hubs and uses the 25 gauge steel rather than wood. I live in the southwest corner of Wyoming – cold weather and lots of wind!! We started out wanting to just extend the growing season and ended up deciding to try and grow vegetables in January as the goal. I live in a 40 Kruschke dome I built 30 years ago so domes are not new to me. This dome design came about because I wanted to work with something very light and very inexpensive yet very easy to build. I also need to make sure my greenhouse would stand up to our intense wind storms so for me the Geodesic was a no brainer! I like the way you think! Can you add a wind turbine and solar to your system? You must get pretty good solar gain even in the winter. I agree about pipe hubs. Super simple super strong. How are you planning to attach the polycarbonate to the frame and seal it against water intrusion? Have you checked out SolaWrap? Expensive but I think thats the next skin for my 25ft dome. Also I like your idea about a solar chimney for cooling! Please send build pics so we can watch the progress! Solar panels will be installed to power a fan that pushes the warm air through the earth tubes during the cold months. A wind turbine is very expensive and the payoff is a little too far out but if prices come down…. Anyway I was looking at screwing the polycarbonate to the frame but after watching a few videos I am thinking of using double stick foam tape and a sealing tape over the seams. As long as the wind doesn’t get under the skin it should stay put. I had a friend talk to me about a clear shrink wrap but he said it only lasts a year or two. Have you have had better luck with it? One more thought, I have a picture of my prototype if you are interested. Just let me know. Please do! I have added you as an Author so please keep us up to speed as you work out the inevitable kinks in your walipini biodome greenhouse hybrid! Is there any update on this? Did he send photos. I want to build something like this and this is all that comes up when searching. Thanks! I like that idea. Couple of things to watch for… make sure the glue is UV resistant too! I did the UV stable 7ml shrinkwrap for the covering on my geodesic greenhouse. It worked great! The only slight drawback was a bit of a plastic smell for a bit. BUT, the tape that the manufacturer supplied to use while shrinking wasn’t UV stable! So anywhere I used that tape it just peeled off in about 6 months. I found another company that makes clear UV stable tape (tape and glue) and that has lasted about a year so far. A friend of mine did a small greenhouse out of plain UV stable greenhouse plastic and that lasted over 7 years and it was not as thick as the shrinkwrap. I talked to several people who have had it last (when the wind can’t get it flapping) for over 10 years. So it’s a bit of a gamble but I hope for 10 years at least. My next cover will be sola-wrap (the infamous Poly-Kedar) expensive but easier to install and covers while insulating in one pass. I will definitely look into your taping down the panels idea. OK So how do I send you the picture? 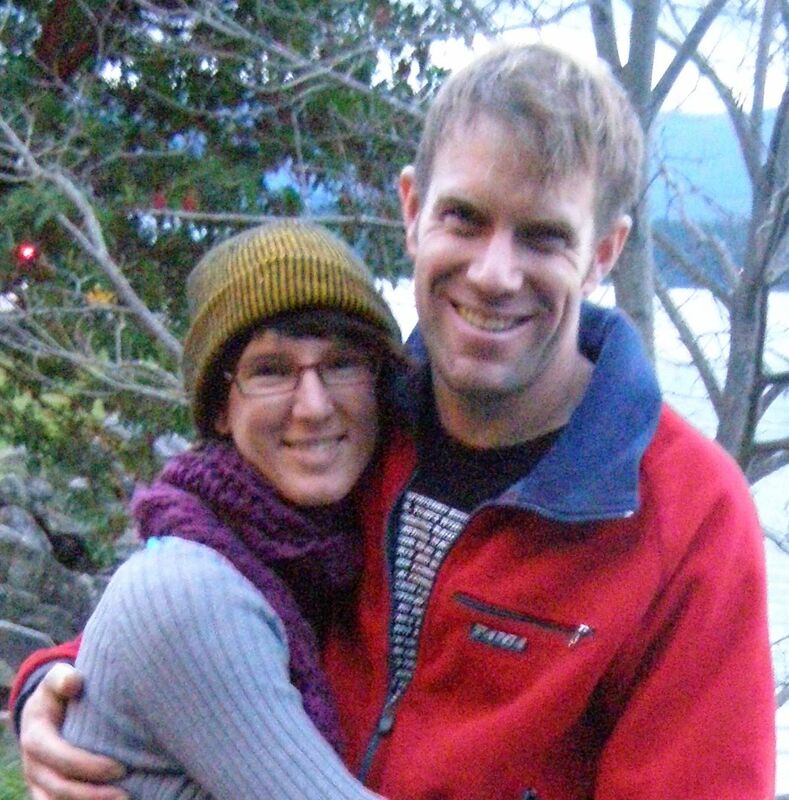 Email them as an attachment to sasha@geodesicgreenhouse.org thanks. I’ve been searching for information on a geothermal geodesic domes, or rather “geodesic walipinis” which has led me to this site. As far as I know, no such thing exists and that surprises me… So I built one! It’s essentially a small scale mock up built with scavenged materials (pvc, bamboo, scrap wood, wire, twine, plastic sheeting and old camping tent and rain fly) and good manual labor. It’s only 12ft wide and about a foot deep, yet the temerature control is noticeable. I intend to add a water reservoir that will double as an aquaponic system. I believe this design has enormous potential. Has anyone had success with their projects? Any updates? Has anyone found any further information on this concept? Great ideas! I love the water for thermal regulation. No one has done this as far as I know so build a big geodesic walipini and send pictures so I can post on the blog! Nice going on the upcycling! I would love to see what you are doing also. Last night I was thinking of a dome walipini and I googled this morning and found this. I would love to see what you’ve done. Our property is the side of a hill, so I was thinking of building a walipini. However, we also have occasional high winds, so a geodesic design might be favorable, plus I like the strength and solar gain. Would the strength of the geodesic dome be lessened if it was not a full circle? I’m thinking of digging into the side of a hill in a geodesic pattern, a 3-4 ft retaining wall on the south side, moving up on the sides until it’s a 9-10 ft wall on the north side. Enclosed by the hill to create thermal mass. To that I would attach the dome. Probably a french drain system all around it (lots of snow and runoff here), and waterproofing. Thoughts or ideas? Sounds like an awesome project! I hope you have a backhoe or mini excavator. Check with a local geotechnical engineer regarding soil slippage slumping on the uphill side of your walipini biodome. That would be my main concern specifically if you have lots of water coming down hill from time to time. To address that I would put in uphill swales to direct surface water away and look at PAHS sheltered underground building. Using a pond liner over the soil uphill to try and reduce moisture. That being said if your back wall of the geodesic dome is 8″ reinforced concrete backfilled with free draining material with PolyDrain cloth backed foundation drainage system with a 4″ PVC pipe to daylight you will most likely be fine. I would personally cut the grade back behind the dome and keep the back retaining wall to max 6ft. Good luck and send pics! I love the ideas here. We are moving from an urban farm in Los Angeles to a mountain cabin at 6700 ft in Utah and are used to growing our own food year round. At the home we’re buying they happen to have a round hole dug for an in-ground trampoline and a playplace dome for their kids. I’m wondering, could we convert the already dug hole and dome into a geodesic walipini? I’d love to hear from others and find some construction plans, pictures, suggestions, etc. Thank you!